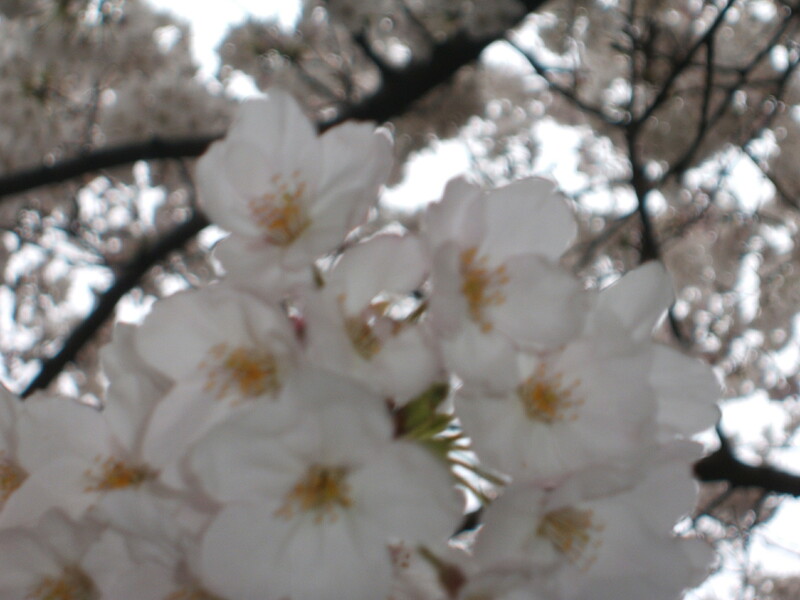 Here are some of the photos my wife, kids and I took at 花見 (cherry blossom viewing) we went to yesterday. 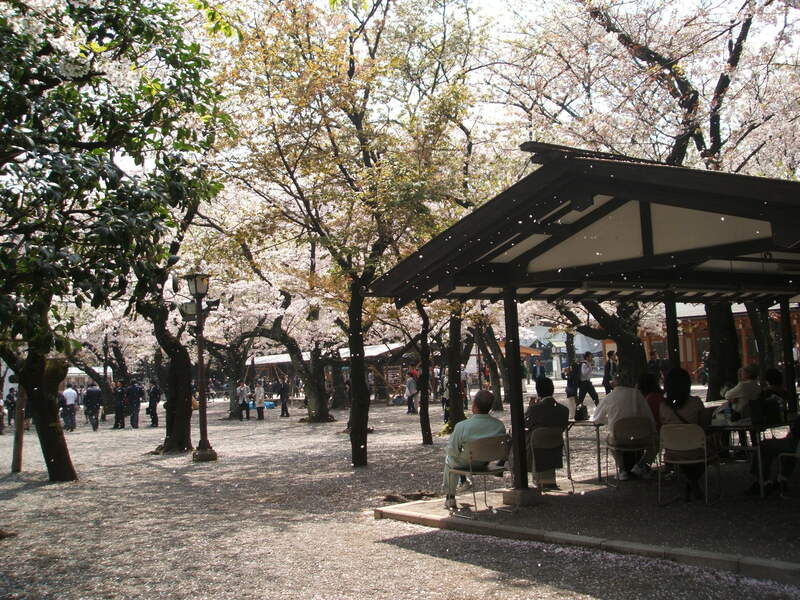 We went to a small park, 靖国神社 (Yasukuni Shrine), and 千鳥ヶ淵 (Chidorigafuchi) near the 日本武道館 (Nippon Budokan). 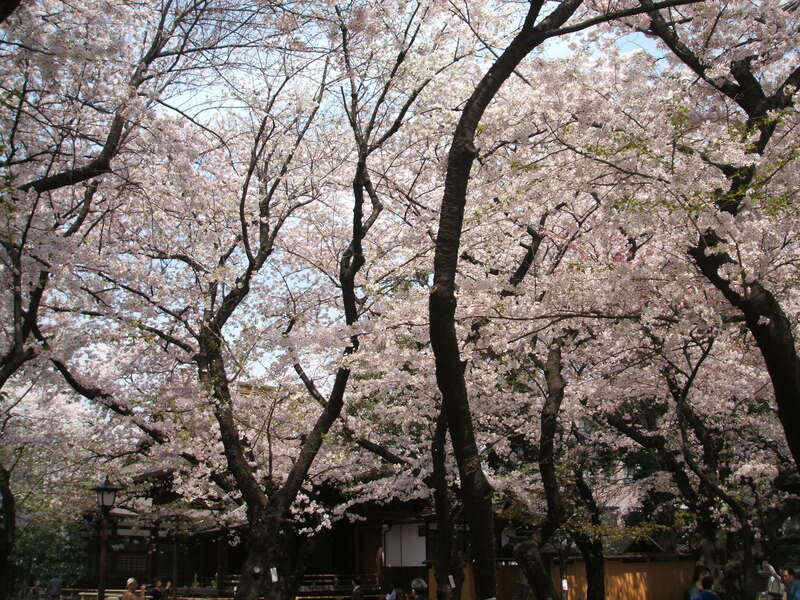 The world-famous 日本武道館 (Nippon Budokan). 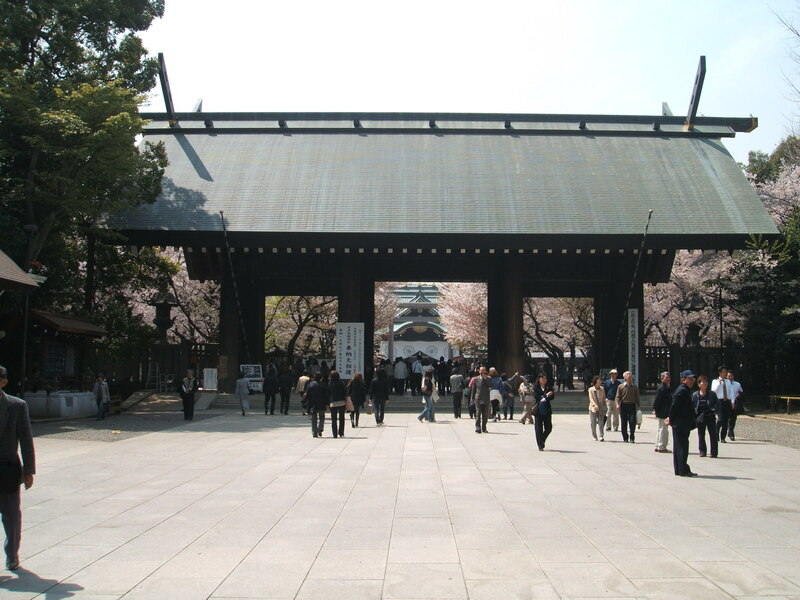 The torii entrance to the 靖国神社 (Yasukuni Shrine). 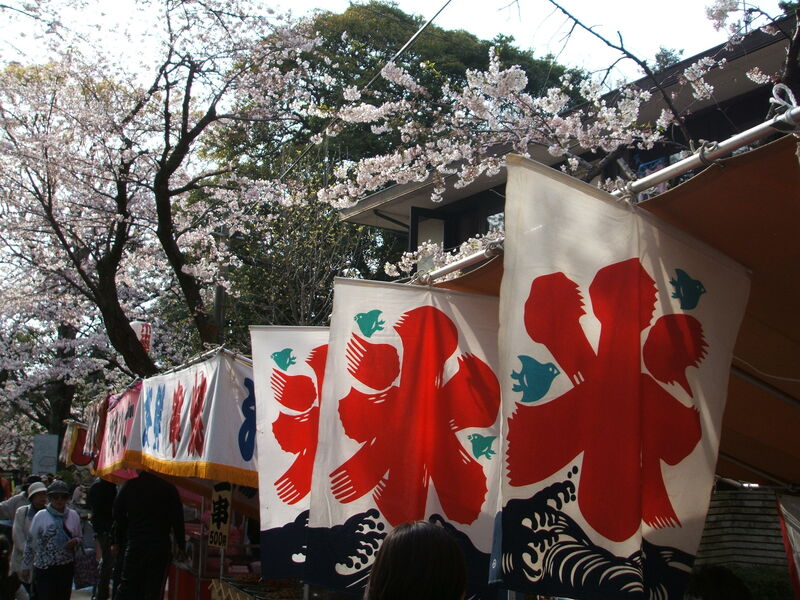 We ate “okonomiyaki” for lunch from one of these ‘yatai’ (traditional Japanese food booths). 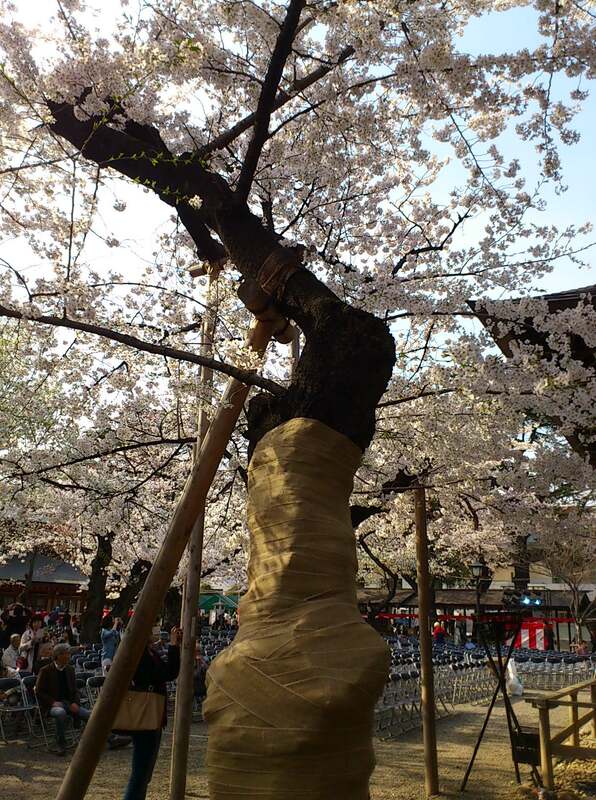 This old sakura tree in Yasukuni Shrine is the official tree that determines the start of “Sakura season” for Tokyo. 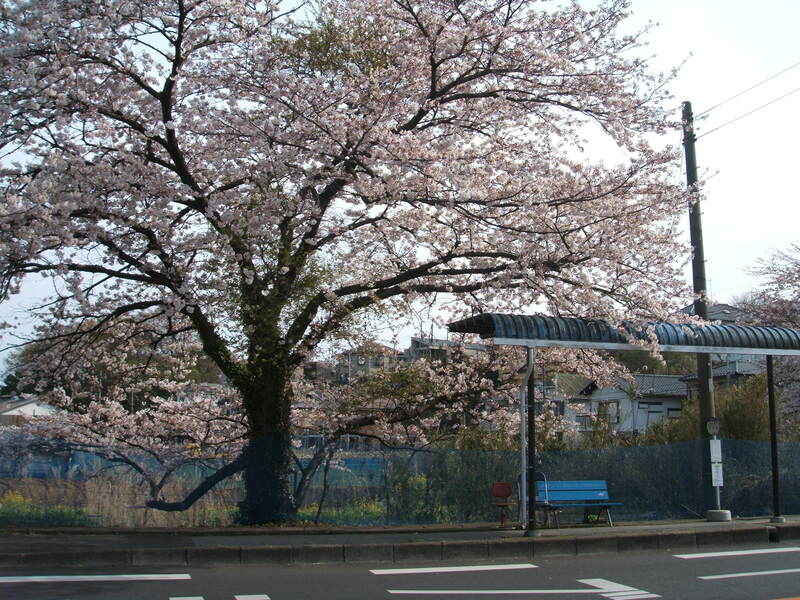 When five flowers bloom on this tree, it’s announced that the season has begun. 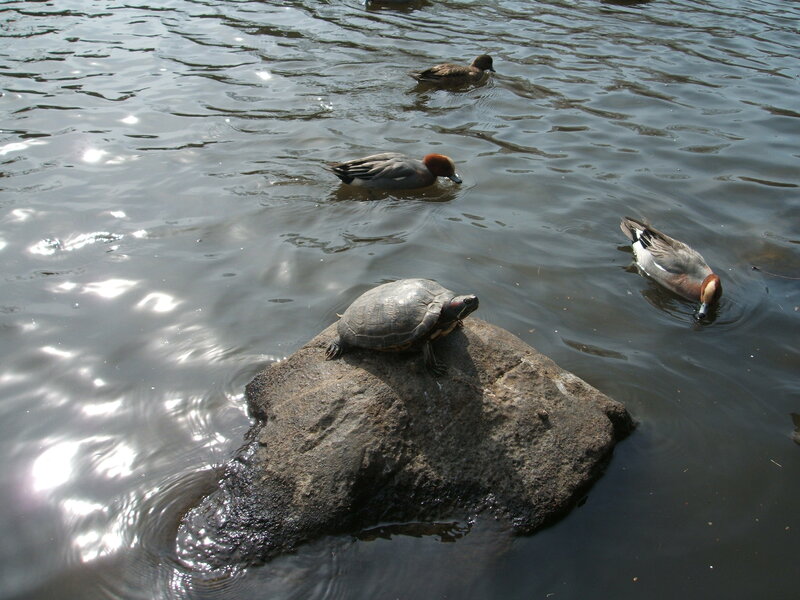 千鳥ヶ淵 (Chidorigafuchi) near the Budokan. 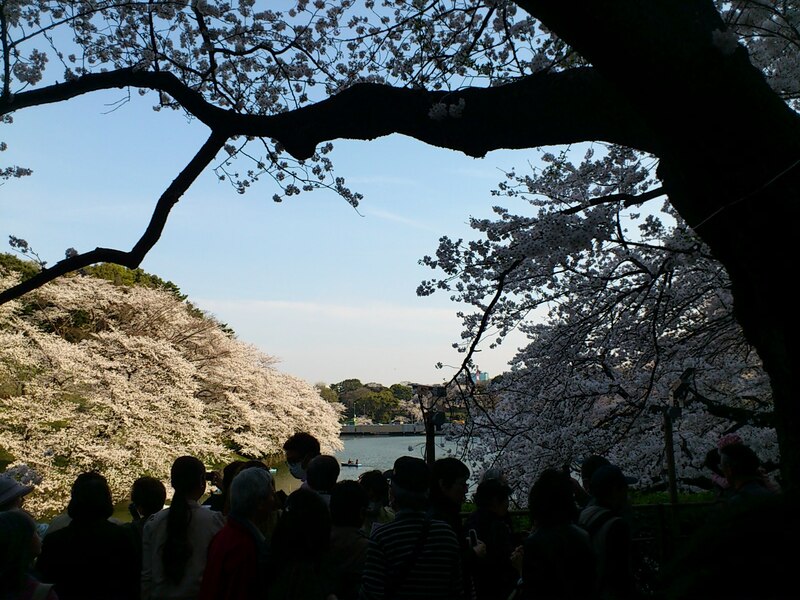 Yesterday we went to a park for 花見 (Cherry Blossom Viewing), which has been a springtime tradition in Japan for centuries. 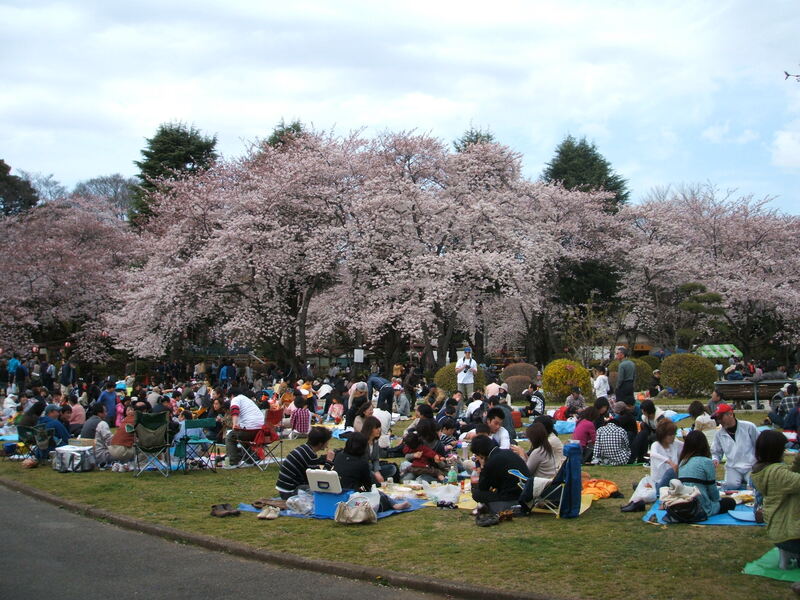 Just as most people in Japan do, we had a picnic under the trees. 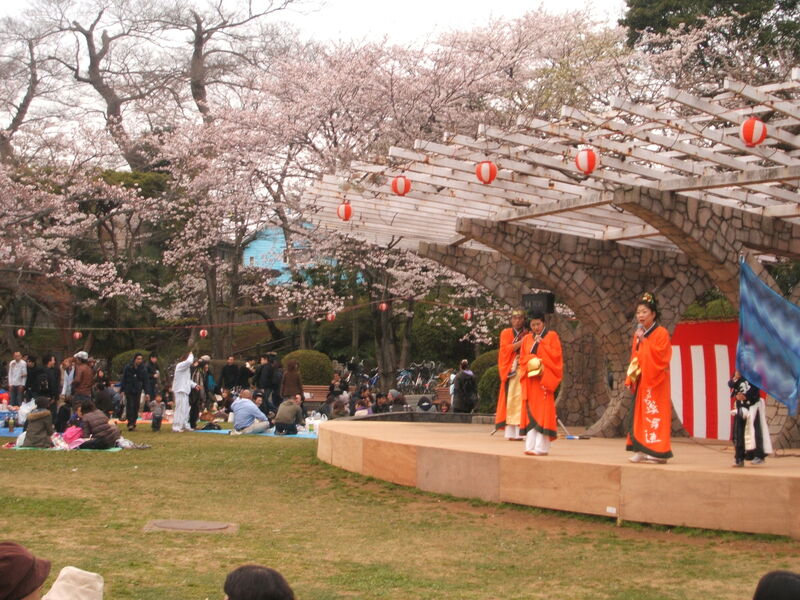 There was a traditional Japanese dance performance. 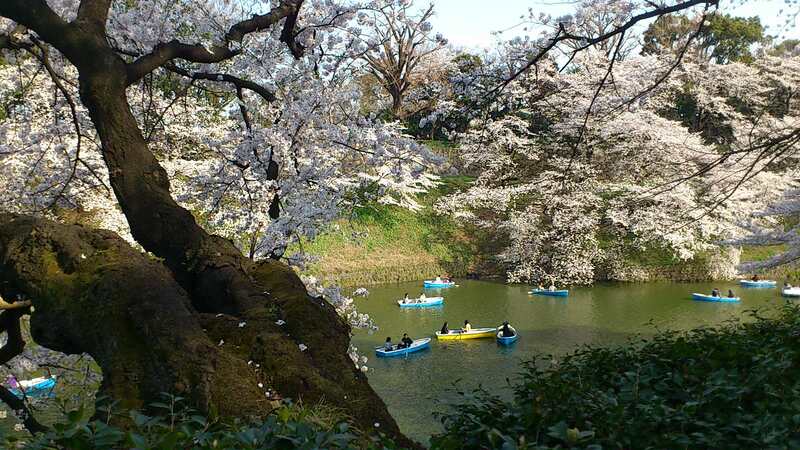 It was a bit cold and overcast in Tokyo today…but the five of us were together, the sakura trees looked beautiful, and my wife made a delicious lunch for us. So we had a good time! 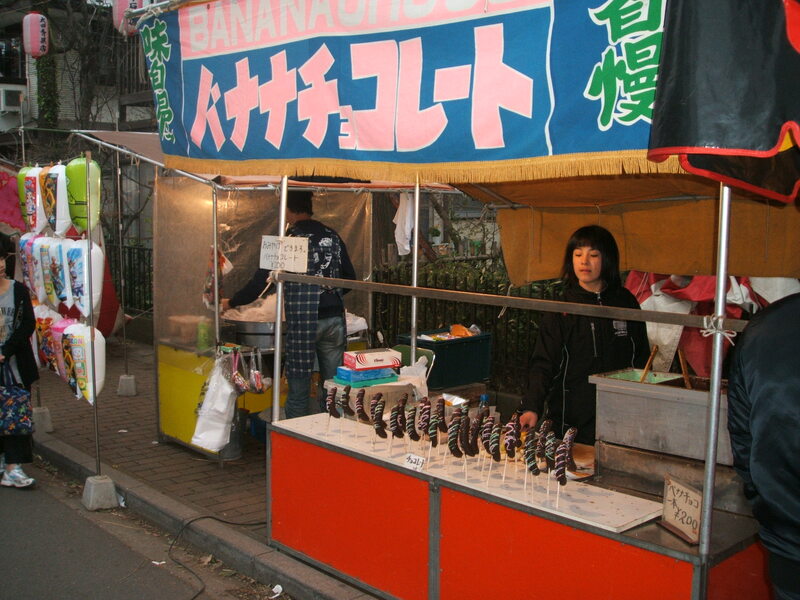 At festivals in Japan, there are almost always booths like this selling snacks and food...like these バナナチョコレート (chocolate-covered bananas). 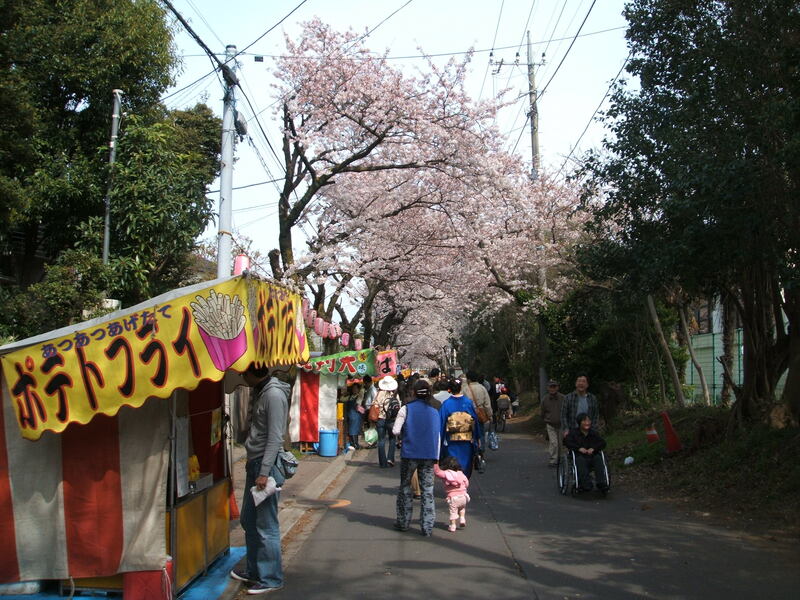 What types of festivals are popular in your country? 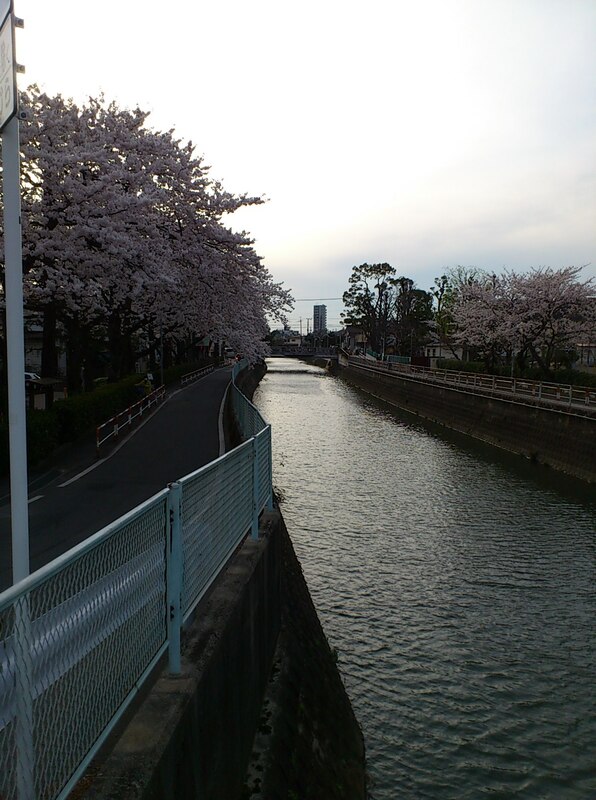 Do sakura (cherry-blossoms) bloom were you live? 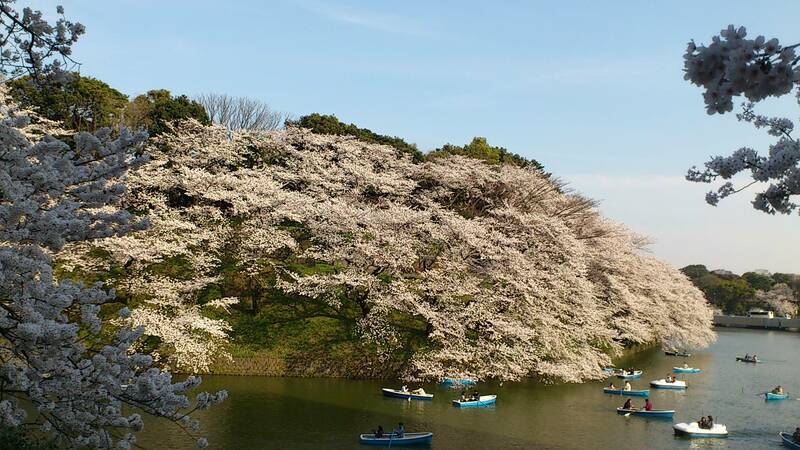 Have you ever been to a 花見 (Cherry-blossom viewing picnic)? On this day it has been a common practice for centuries for people to play a practical joke on others. And if someone believes that joke or prank is true, then they are the “April Fool”. Many major newspapers, magazines, TV shows, and websites often join this holiday and print a false news article that is usually quite preposterous and unbelievable…but many people “fall for the joke”. 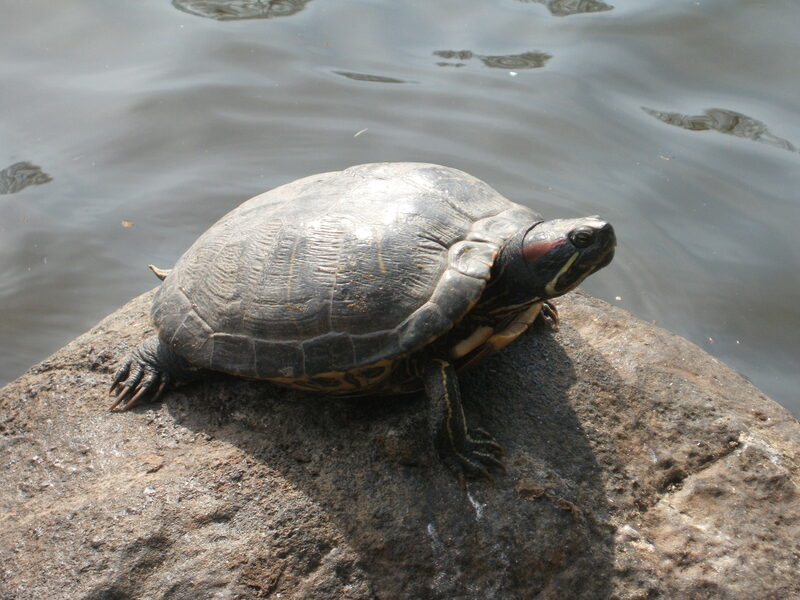 They sometimes give hints in the article that it’s an “April Fools” joke, such as listing a false person’s name such as “Lirpa Sloof” (“April Fools” spelled backwards) as a news source, or listing a false product serial number such as “20100401” (2010/04/01…today’s date). And then either the next day or somewhere in the same day’s publication, they’ll announce that it was only an “April Fools joke”. On the “Museum Of Hoaxes” website, they a list of “The Top 100 April Fool’s Day Hoaxes Of All Time“. 1984 April 1: the Eldorado Daily Journal newspaper of Illinois, USA announced a contest to see who could save the most daylight for daylight savings time….whoever succeeded in saving the most daylight would win. Only pure daylight would be allowed—no dawn or twilight light, though light from cloudy days would be allowed. Moonlight was strictly forbidden. Light could be stored in any container. 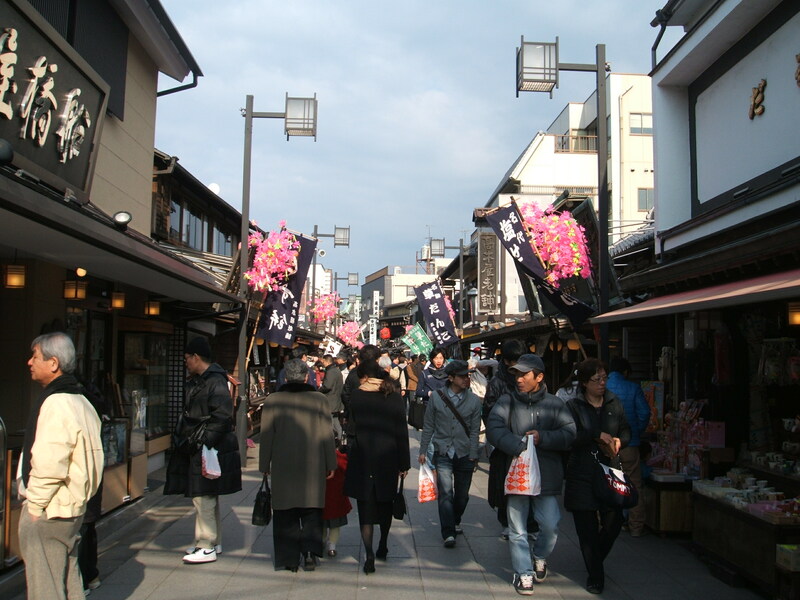 The contest received a huge, nationwide response. The paper’s editor was interviewed by correspondents from CBS and NBC and was featured in papers throughout the country. 1997 April 1: An email message spread throughout the world announcing that the internet would be shut down for cleaning for twenty-four hours from March 31 until April 2. The cleaning would be done by “five very powerful Japanese-built multi-lingual Internet-crawling robots (Toshiba ML-2274) situated around the world.” During this period, users were warned to disconnect all devices from the internet. This joke was an updated version of an old joke that used to be told about the phone system. For many years, gullible phone customers had been warned that the phone systems would be cleaned on April Fool’s Day. They were cautioned to place plastic bags over the ends of the phone to catch the dust that might be blown out of the phone lines during this period. 1981 April 1: The Daily Mail in London, England ran a story about an unfortunate Japanese long-distance runner, Kimo Nakajimi, who had entered the London Marathon but, on account of a translation error, thought that he had to run for 26 days, not 26 miles. 1975 April 1: Australia’s This Day Tonight news program revealed that the country would soon be converting to “metric time.” Under the new system there would be 100 seconds to the minute, 100 minutes to the hour, and 20-hour days. 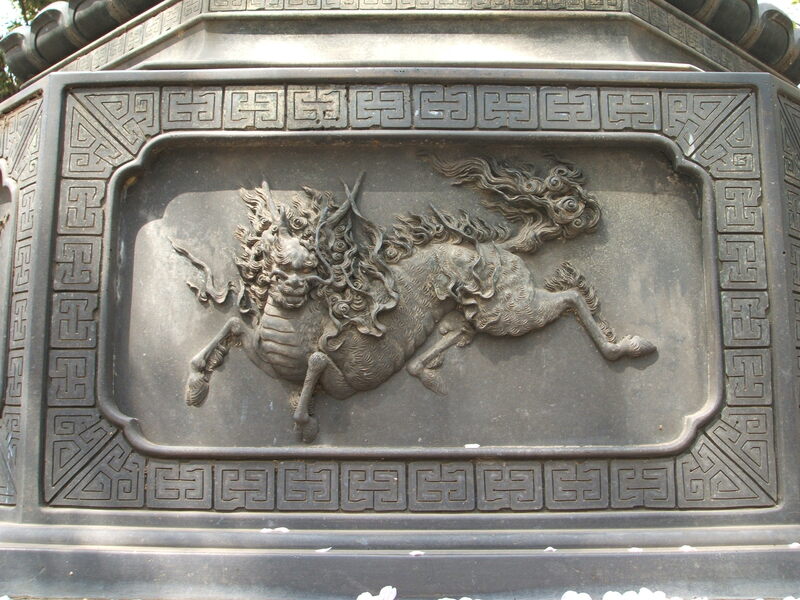 Furthermore, seconds would become millidays, minutes become centidays, and hours become decidays. They received numerous calls from viewers who fell for the hoax. One frustrated viewer wanted to know how he could convert his newly purchased digital clock to metric time. 2008 April 1: The BBC of England announced that camera crews filming near the Antarctic had captured footage of penguins taking to the air. It even offered a video clip of these flying penguins, which became one of the most viewed videos on the internet. 1998 April 1: Burger King published a full page advertisement in the USA Today newspaper announcing the introduction of a new item to their menu: a “Left-Handed Whopper” specially designed for the 32 million left-handed Americans. 1996 April 1: The Taco Bell Corporation announced it had bought the “Liberty Bell” monument in America and was renaming it the “Taco Liberty Bell”. Hundreds of outraged citizens called the National Historic Park in Philadelphia where the bell was housed to express their anger. 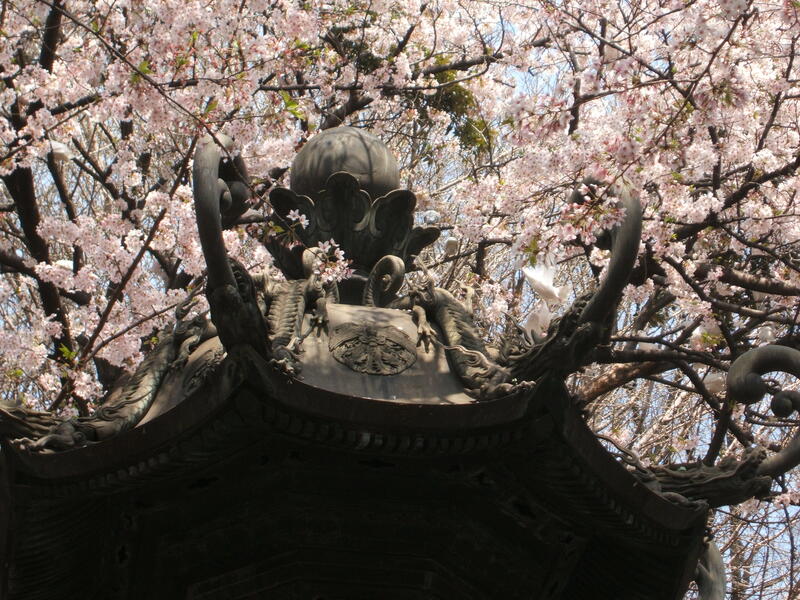 Taco Bell's April Fool ad about the "Taco Liberty Bell"
1957 April 1: The BBC in England announced that thanks to a very mild winter…Swiss farmers were enjoying a bumper spaghetti crop. 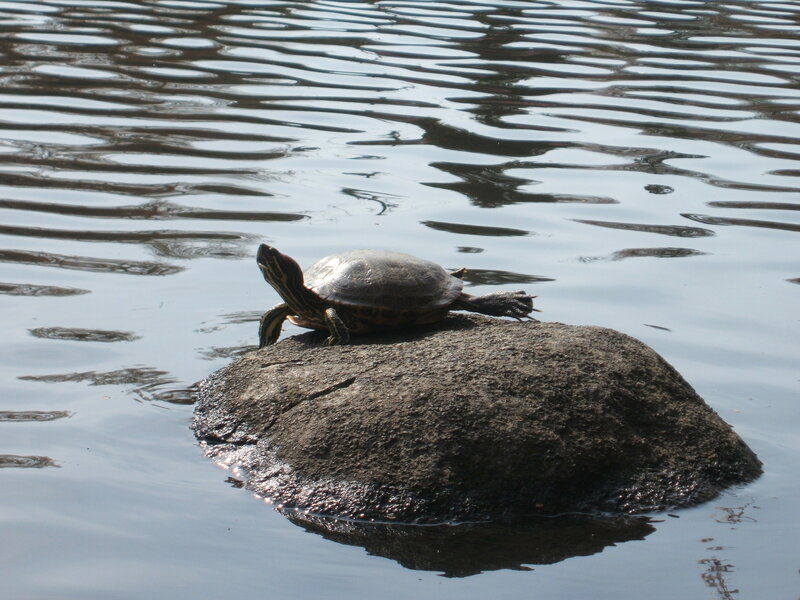 Have you ever been fooled by an “April Fools” joke? Have you ever fooled anyone with one? 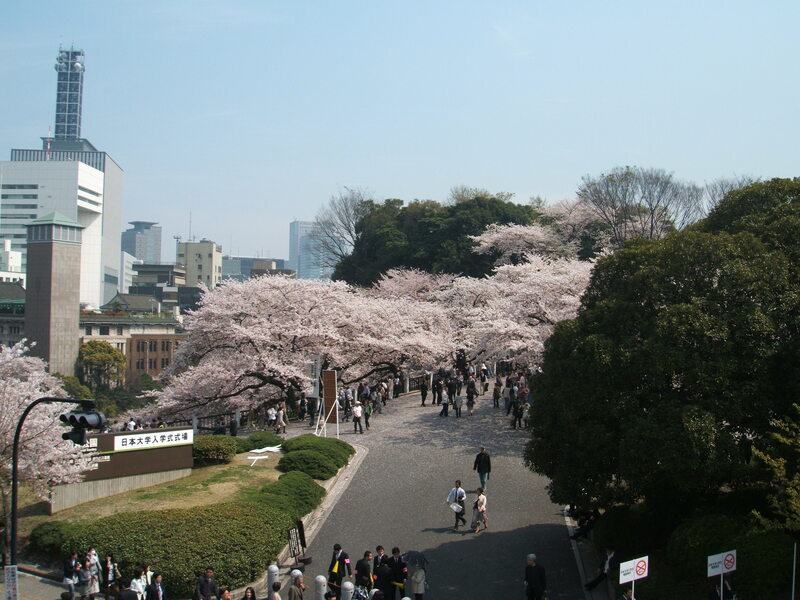 On a different note, yesterday I noticed a few Sakura trees blooming here in Tokyo. 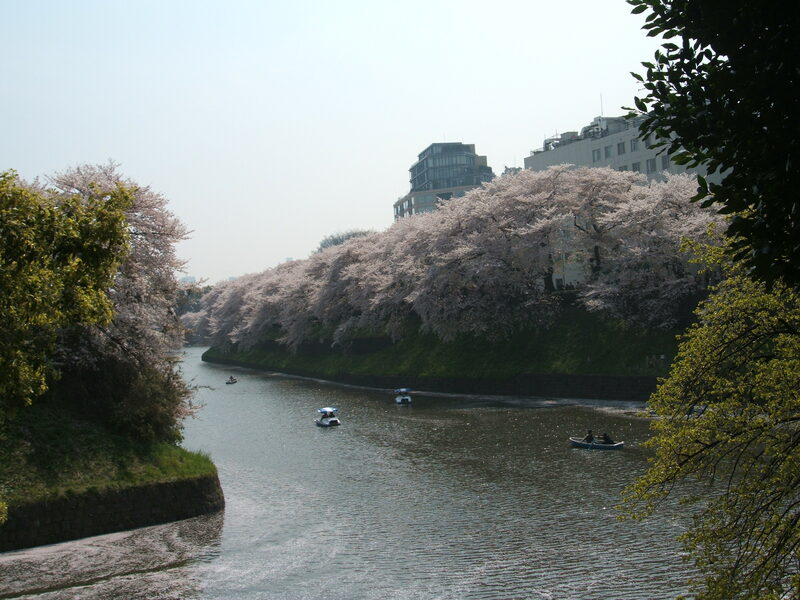 Next weekend we plan to go 「花見」 (“Cherry Blossom Viewing”). Today we went to 柴又 (Shibamata, Tokyo). 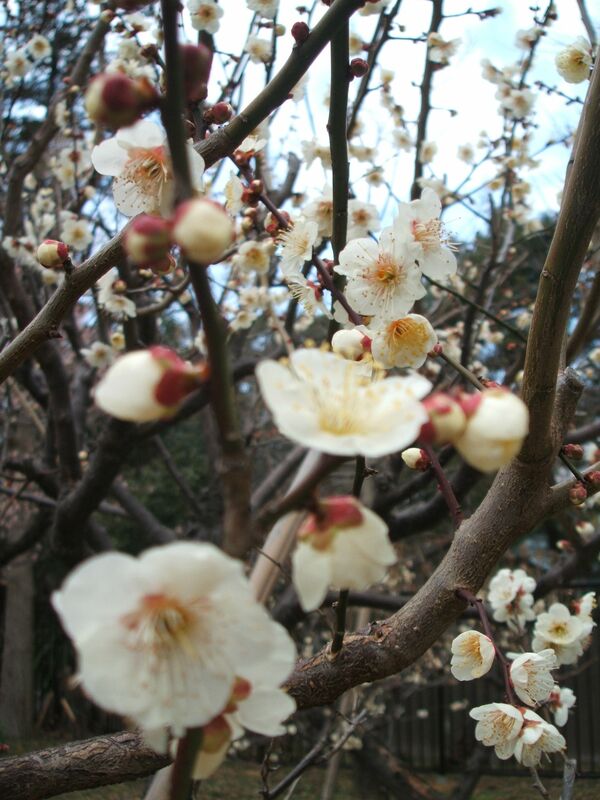 We also went to a nearby park and saw the 梅の花 (Plum flowers) and 寒桜 (Winter Cherry Blossoms) were in bloom. 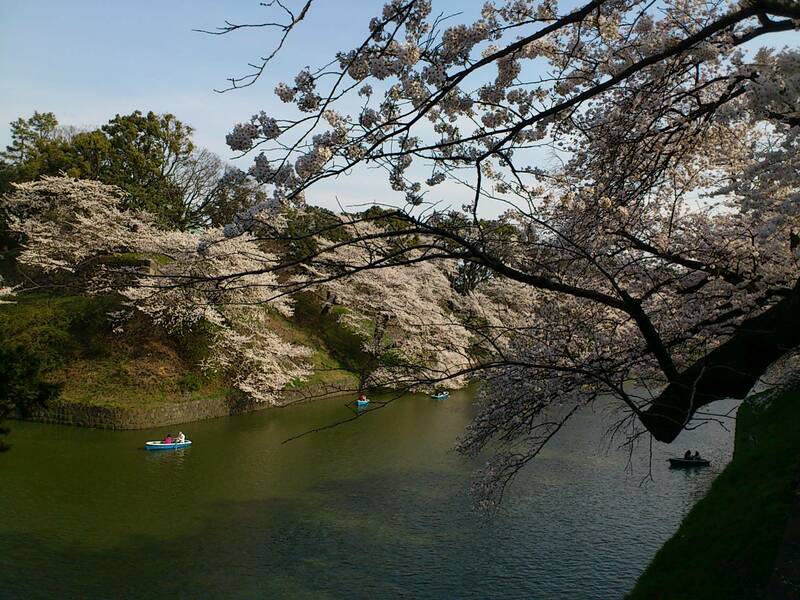 It’s still cold in Tokyo…but spring’s not too far off now. 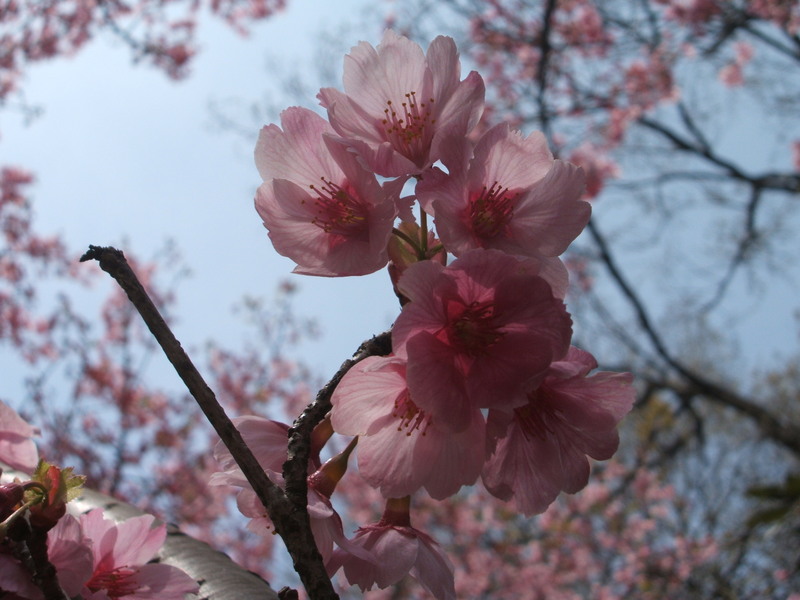 What kinds of flowers are in bloom where you live in the world? 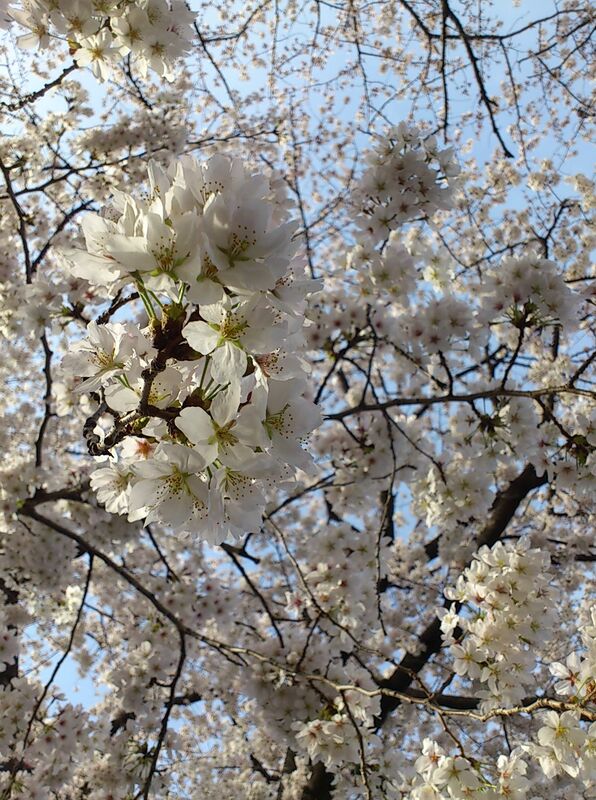 What are the signs of winter ending and spring coming in your country? 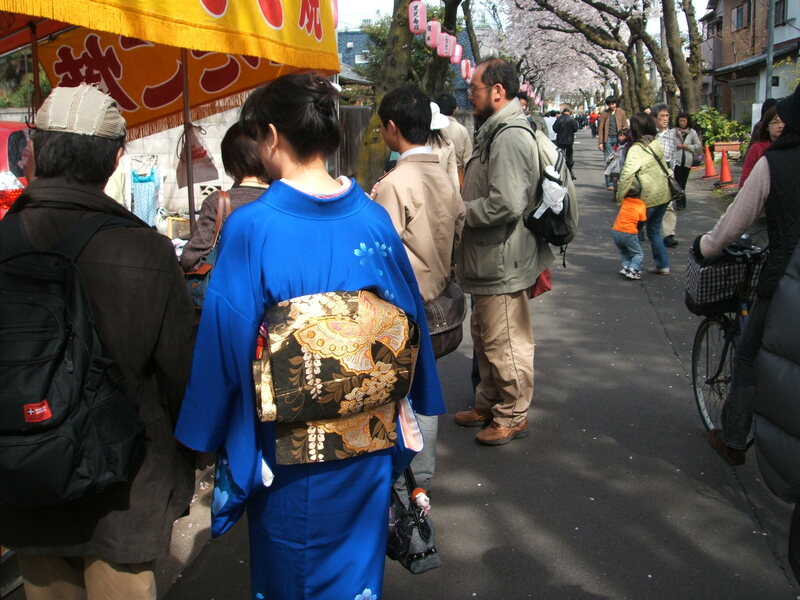 It seems that there are a number of Japanese festivals in America at various times of the year and in various cities around America. 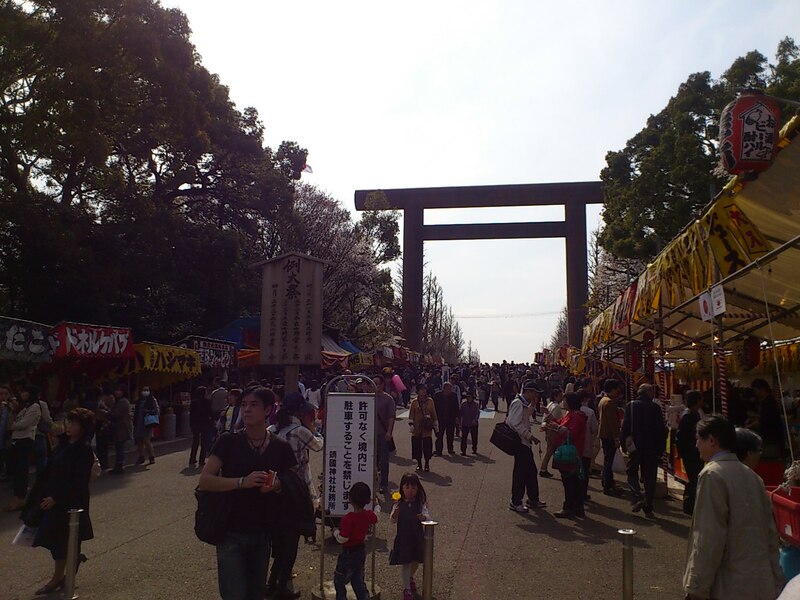 I’d like to attend a Japanese festival in America and see how similar or different it is from a real Japanese festival! 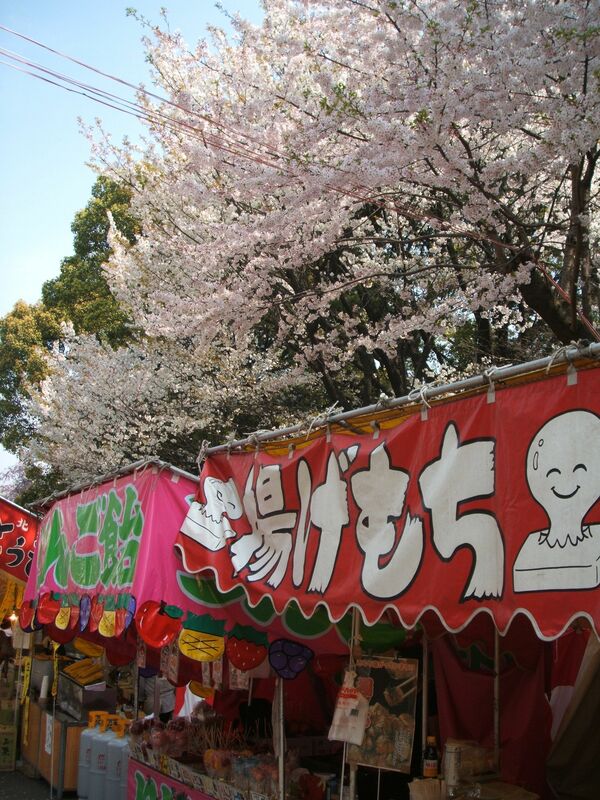 Have you ever been to a Japanese festival in America (or another country)? How was it? 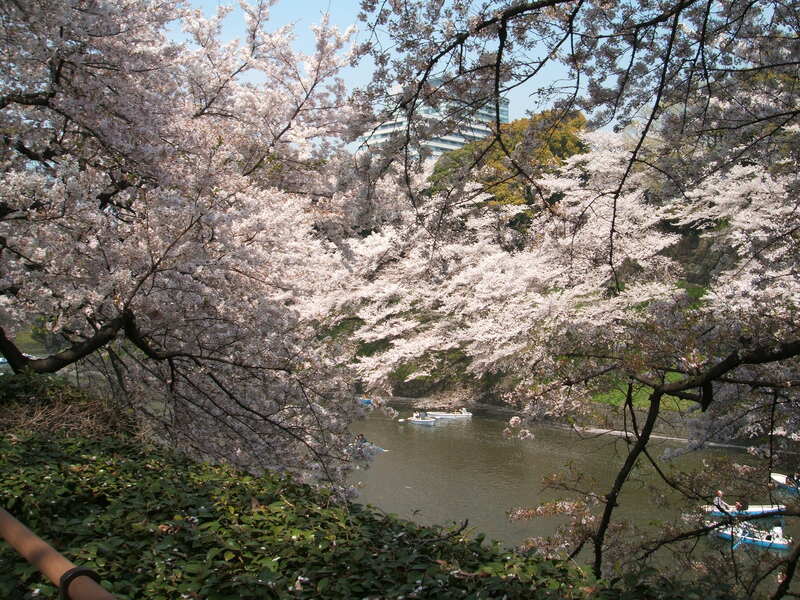 ２００９年９月１９日(土曜日)から９月２０日(日曜日)まで。 (Saturday, 19 September 2009 – Sunday. 20 September). 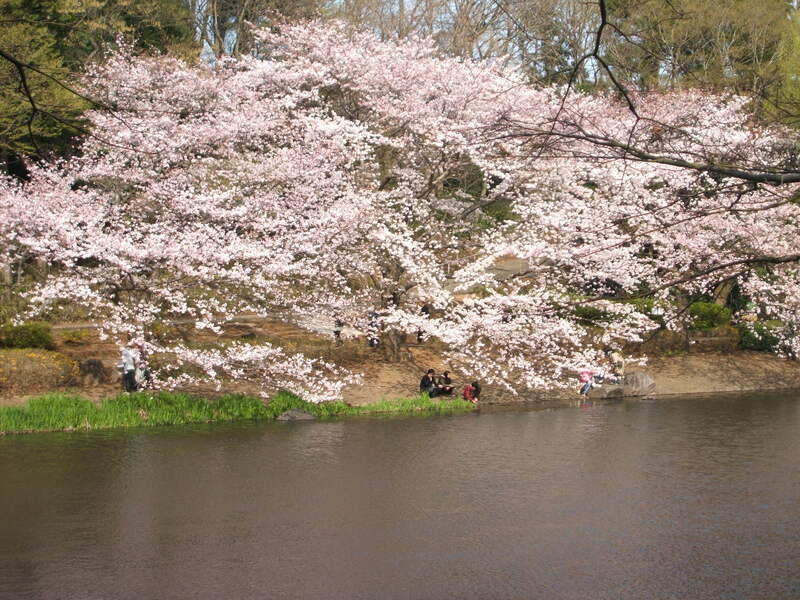 All of the Japanese festivals in America that I found online have already finished this year…except this one. If you’re in Atlanta, Georgia USA this September 19 -20, you should consider checking out this festival. 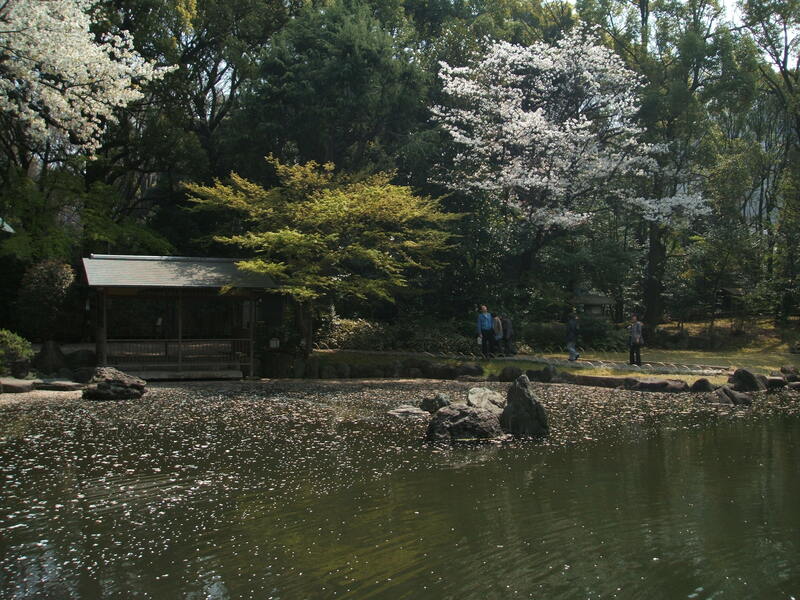 They have scheduled martial arts shows, 盆栽 (bonsai), 生花 (ikebana), アニメ (anime), Japanese food, etc. 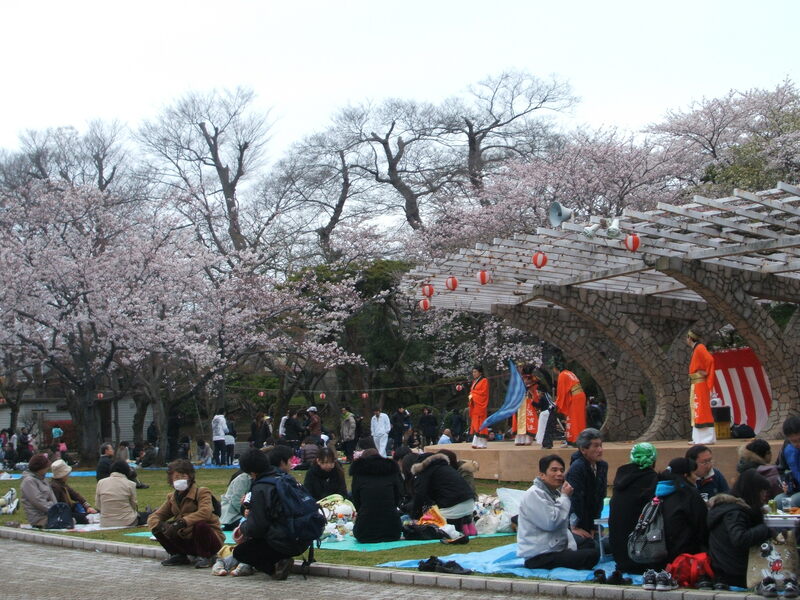 This festival was held in Texas, USA on ２００９年４月２５日から４月２６日まで。 (2009 April 25-26). Do you go to it? 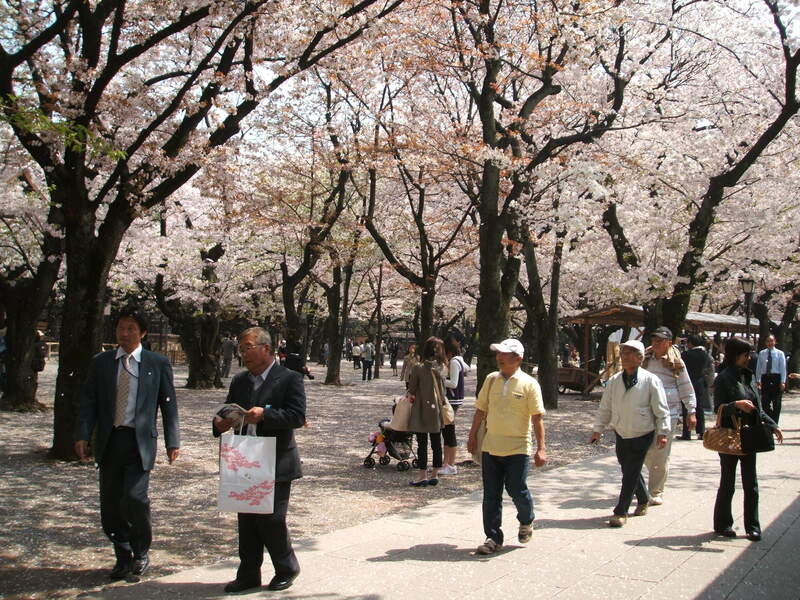 This year’s festival in Washington D.C. was held on ２００９年３月２８日から４月１２日まで。 (2009 March 28 – April 12). 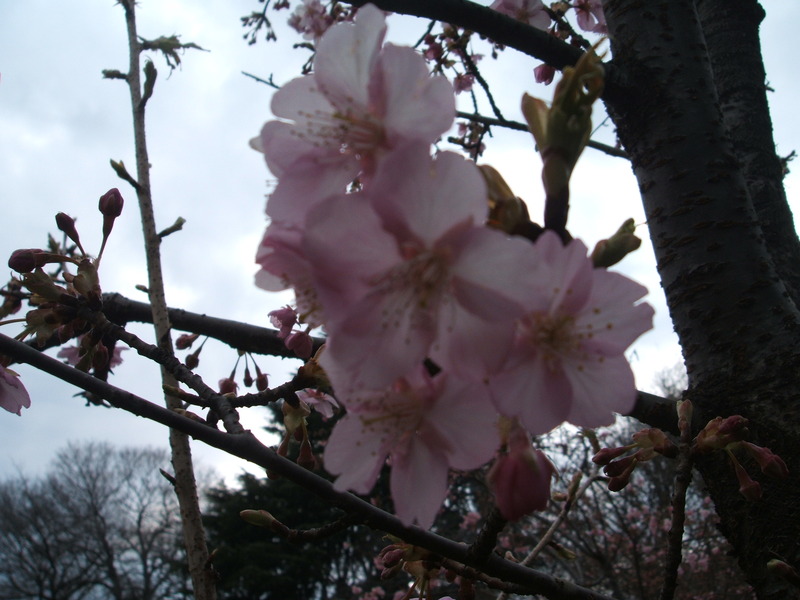 Next year’s will be ２０１０年３月２７日から４月１１日まで。 (2010 March 27 – April 11). Did you go to this festival? 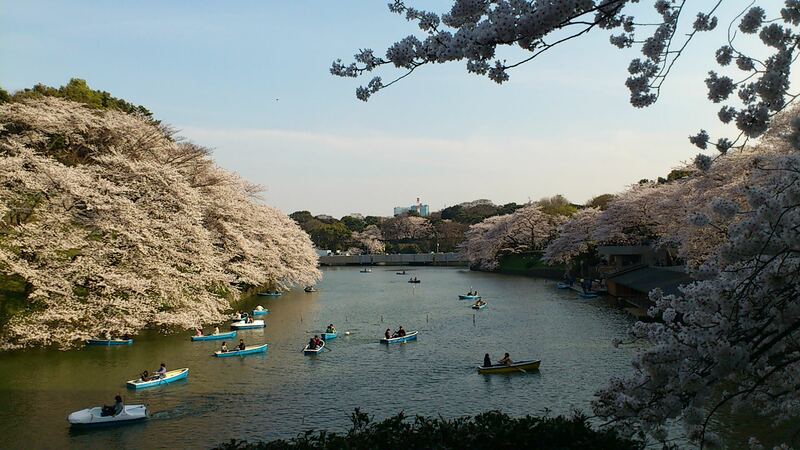 Are you planning to go next year? 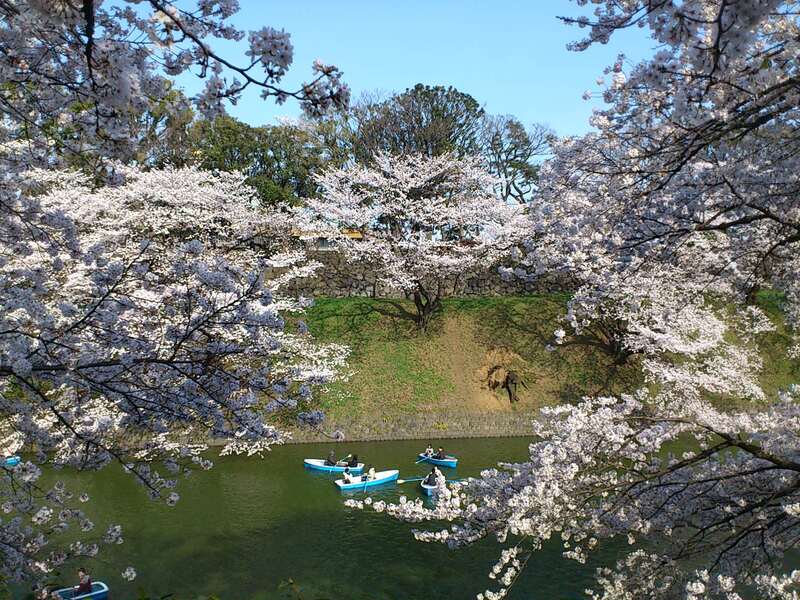 I heard about this festival on the TV news here in Japan because Jero performed at it this year (I wrote a post about it last March. Click here to read it). 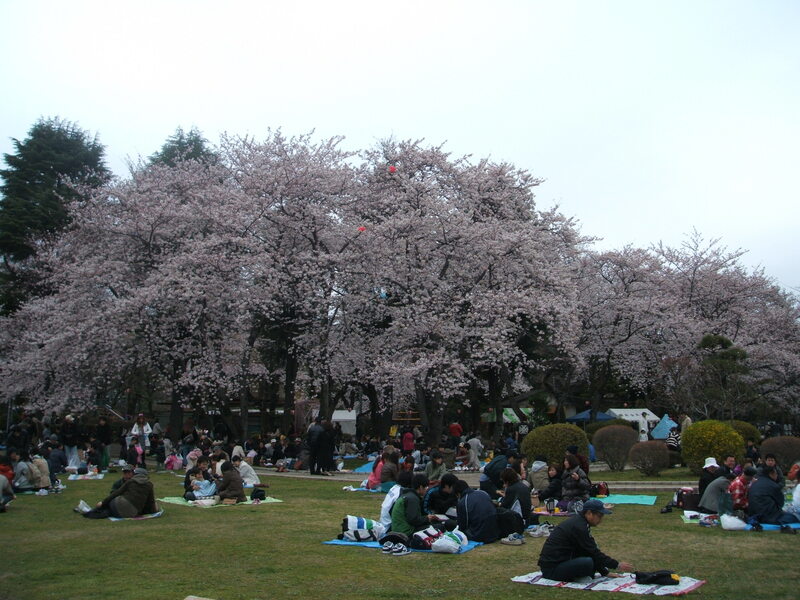 This year’s festival was on ２００９年４月５日。 (2009 April 5). Is it because there’s currently a “Japan boom” in America? 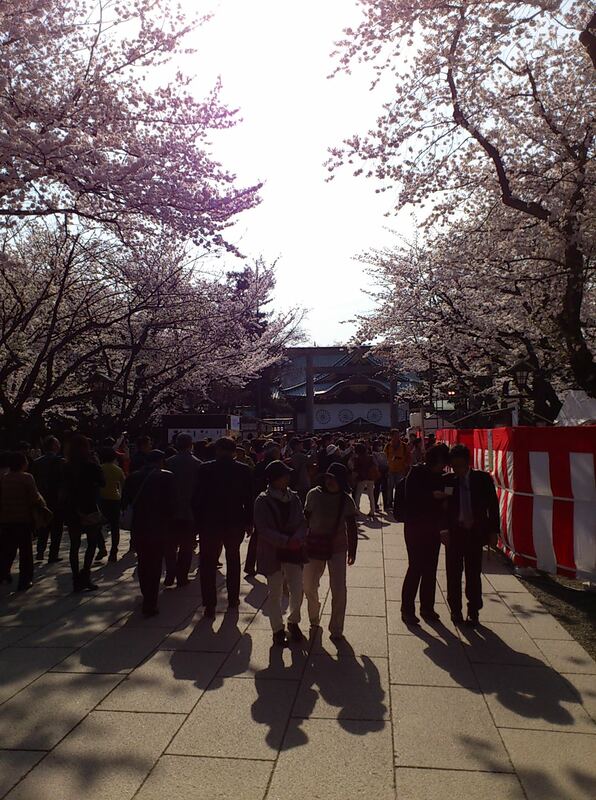 Have you been to a Japan festival? 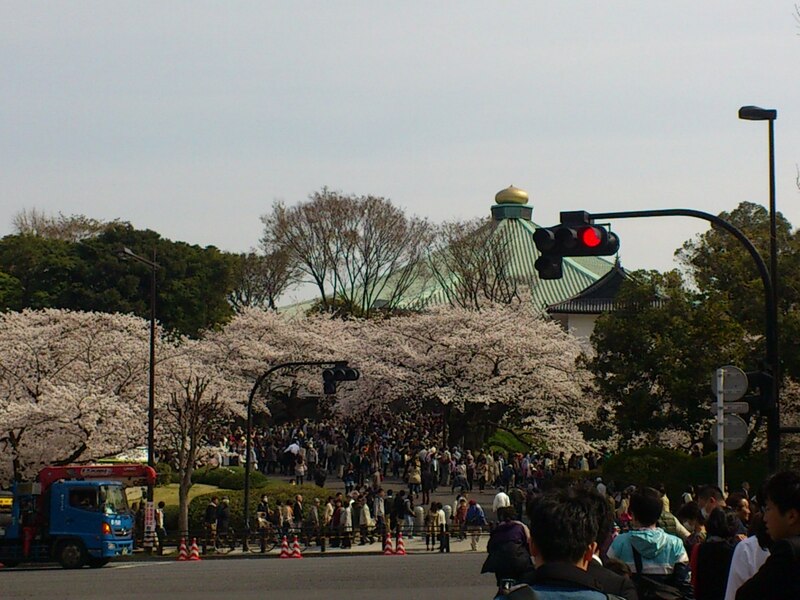 Today my wife and I went to 靖国神社 (Yasukuni Shrine). 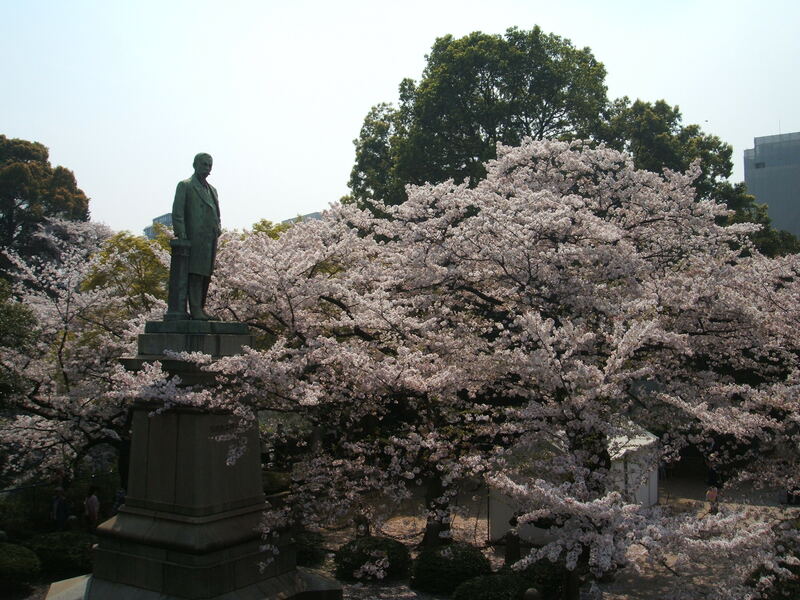 靖国神社 (Yasukuni Shrine) is a beautiful shrine in Tokyo that is dedicated to all who have died defending Japan in battle. 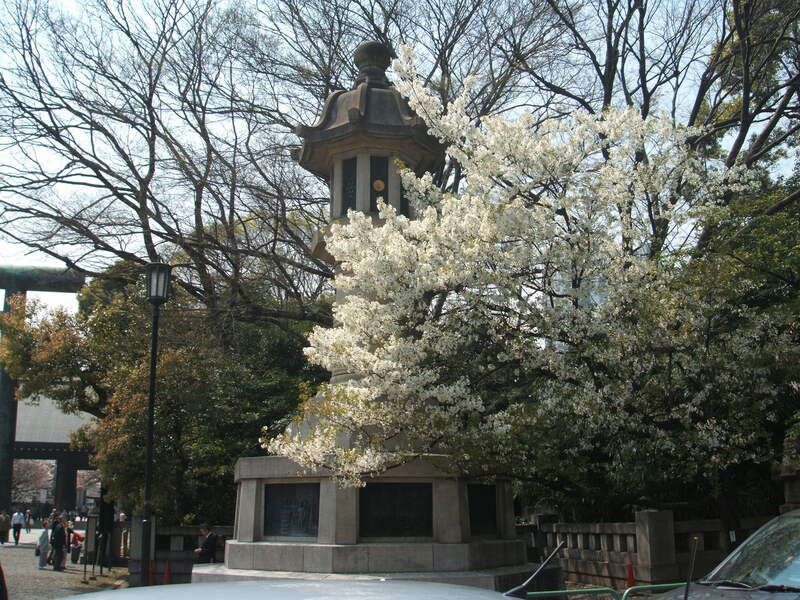 Some of the WW2 veterans enshrined at 靖国神社 (Yasukuni Shrine) have been classified as war criminals by Allied courts. 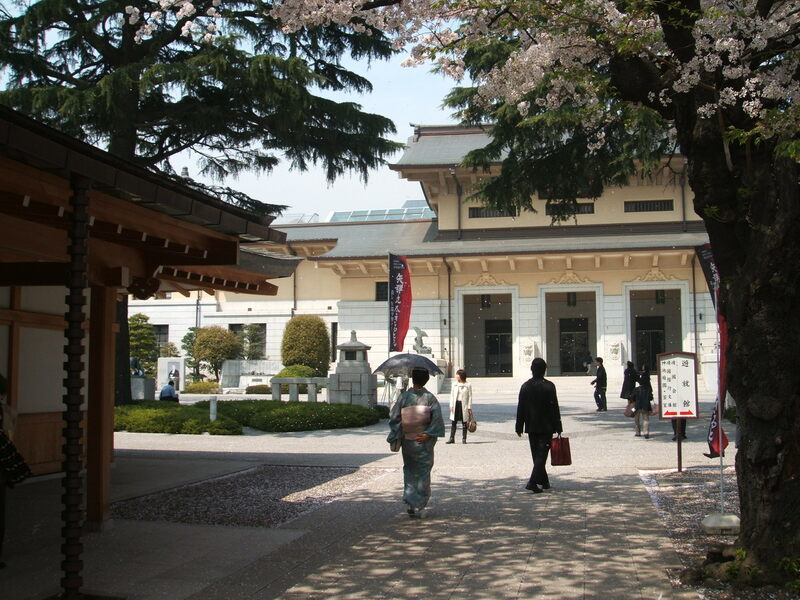 So, for that reason, 靖国神社 (Yasukuni Shrine) is a controversial place, especially with neighboring Asian countries. 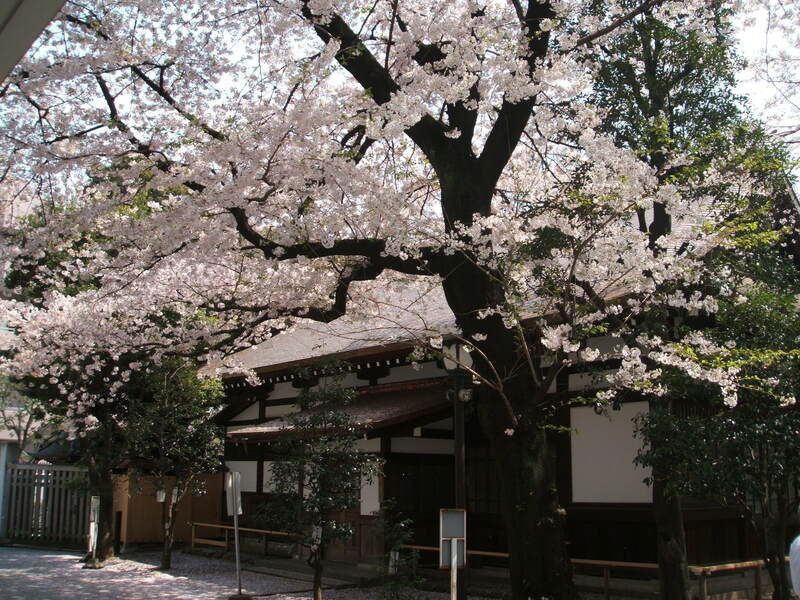 To me, 靖国神社 (Yasukuni Shrine) is Japan’s equivalent to America’s Arlington Veterans Cemetery in Washington D.C..
Anyways, the reason we went to 靖国神社 (Yasukuni Shrine) was to see the 桜祭り (Cherry Blossom Festival) there. 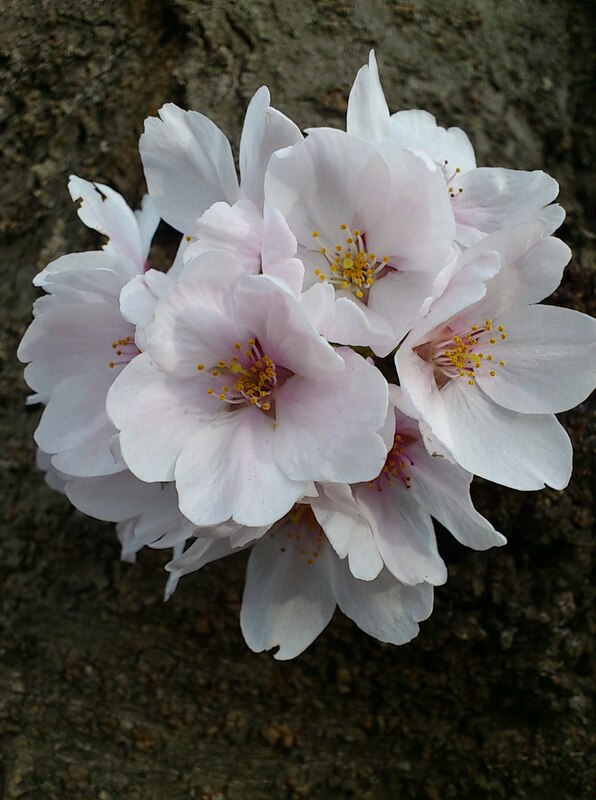 The 桜 (Cherry Blossoms) in Tokyo are close to the end of their short life. They are beginning to fall to the ground. 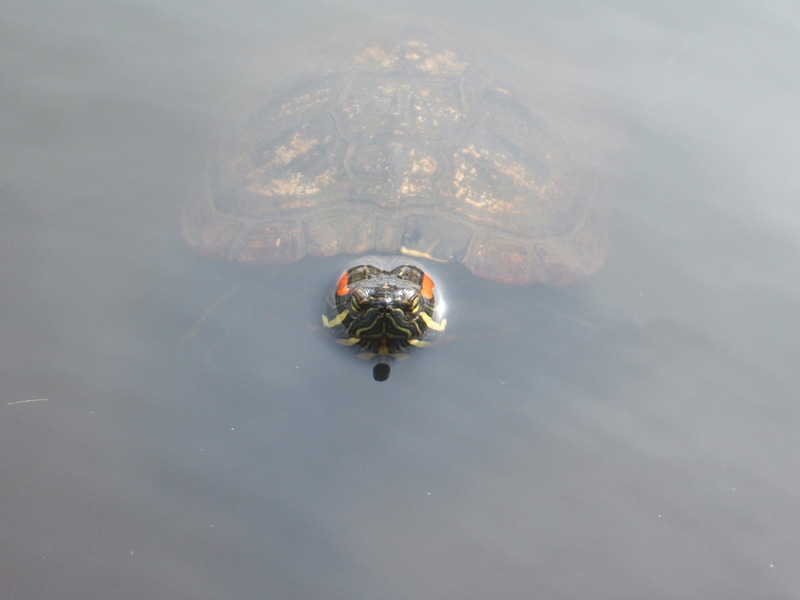 Soon they’ll be gone until next year…so, as we do every year, we’re appreciating them before they’re gone. 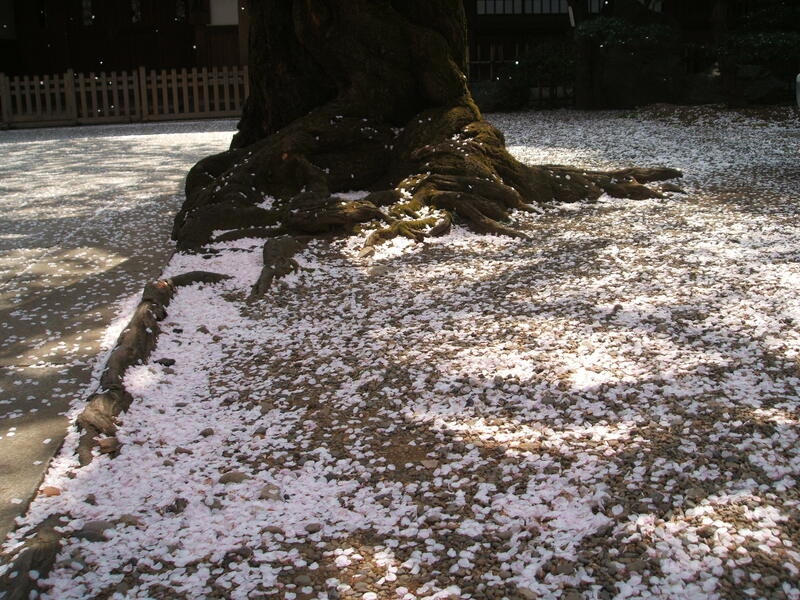 Whenever the wind gently blew today, the 桜の花びら (petals of the Cherry Blossom flowers) would fall to the ground. 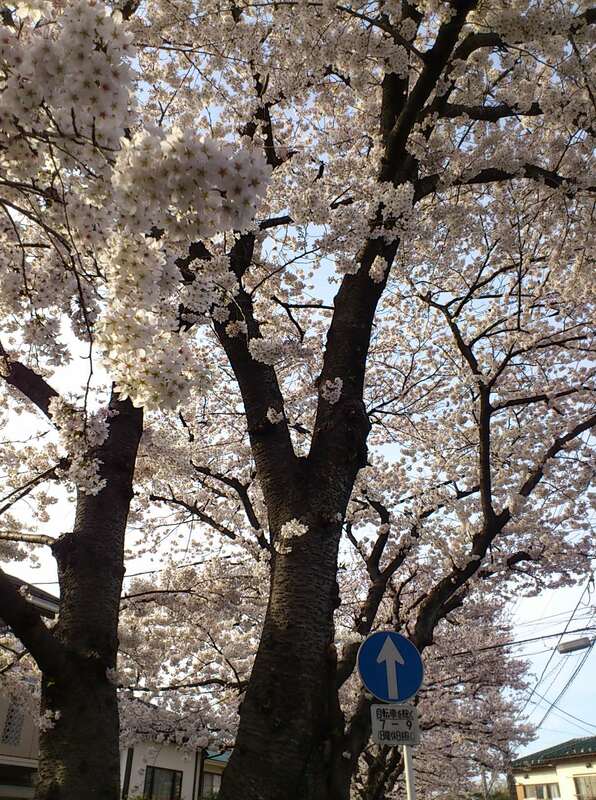 It was like a beautiful pink snowfall! 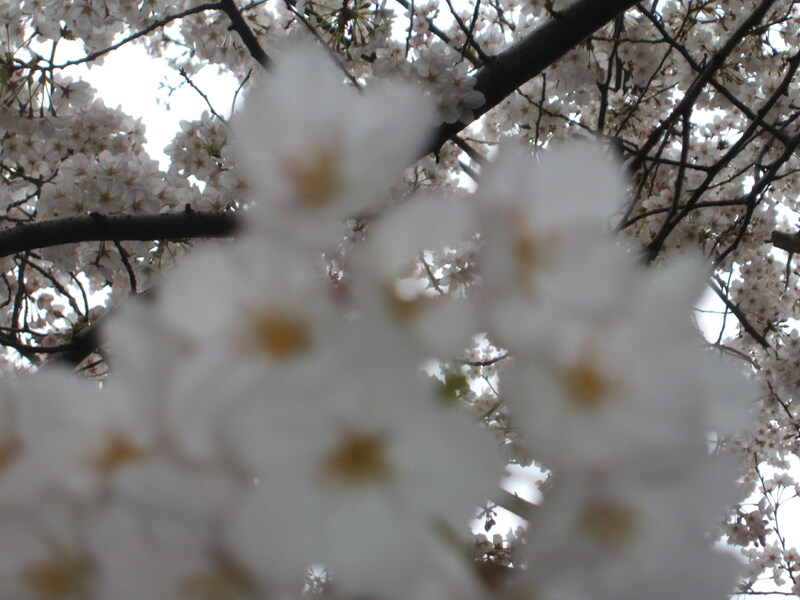 Can you see the falling petals in this photo? 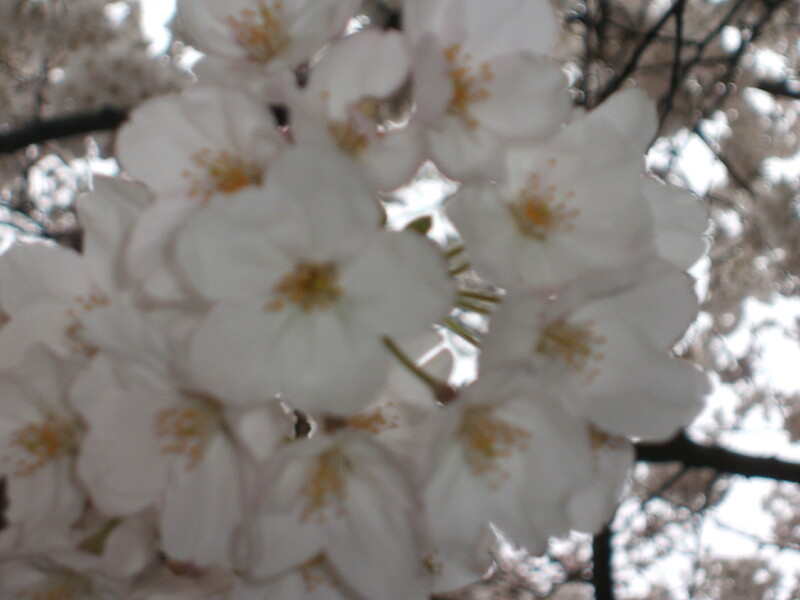 You can see the falling petals in this picture too! 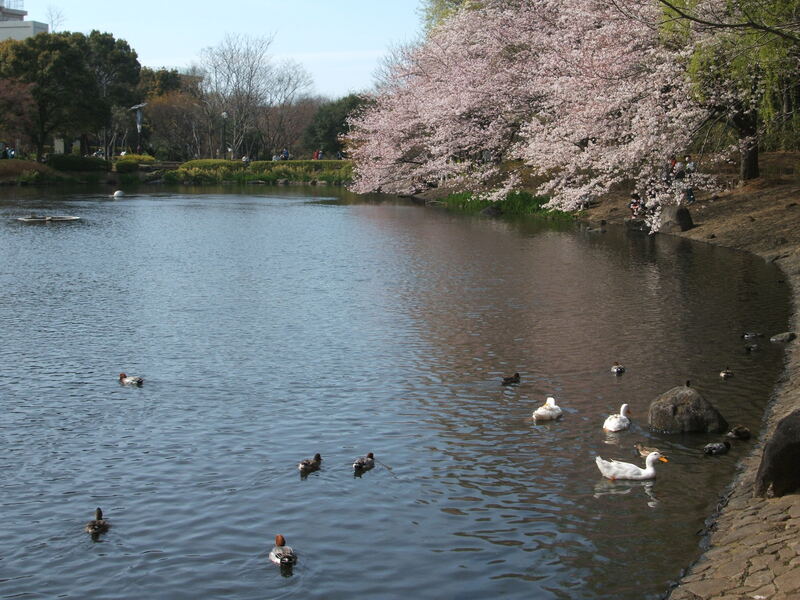 Sakura petals are floating in the lake.